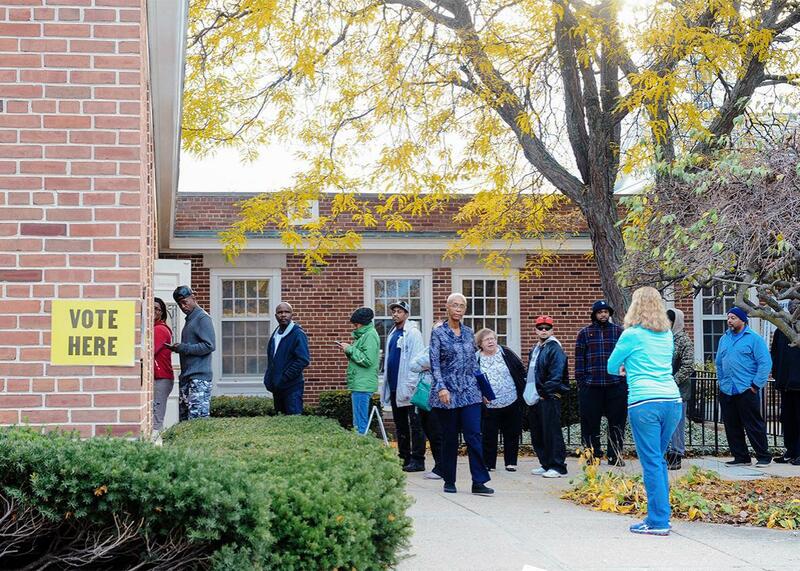 People line up to cast their ballots at a polling station on Nov. 8 in Flint, Michigan. Our analysis projects publicly accessible exit-poll data for the past two elections onto turnout figures in the Rust Belt 5, to look at the whole picture, including third-party voters and those staying at home. Here’s what we found. Compared with Republicans’ performance in 2012, the GOP in the Rust Belt 5 picked up 335,000 additional voters who earned less than $50,000 (+10.6 percent). 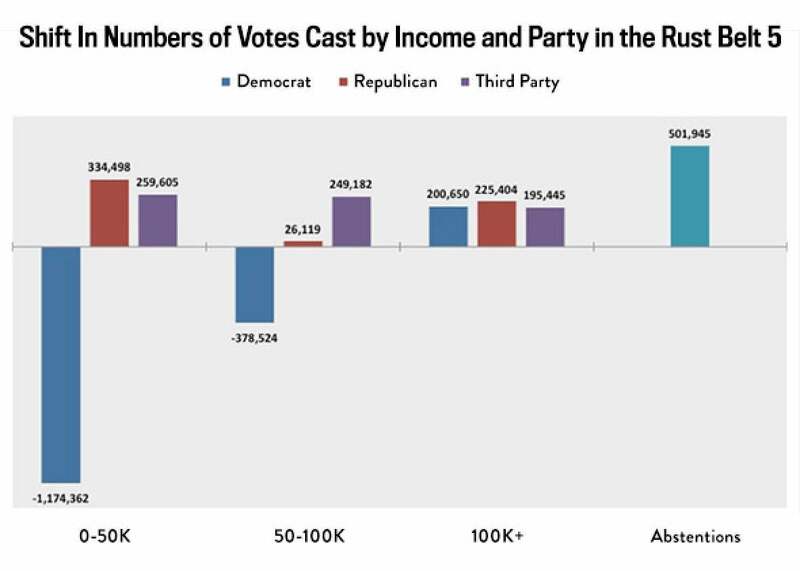 But the Republicans’ gain in this area was nothing compared with the Democrats’ loss of 1.17 million (-21.7 percent) voters in the same income category. Likewise, Republicans picked up a measly 26,000 new voters in the $50–$100K bracket (+0.7 percent), but Democrats lost 379,000 voters in the same bracket (-11.7 percent). The working class is not the only part of this equation. Analysis elsewhere suggests that in states such as Wisconsin, a significant fraction of Democrats’ loss relative to 2012 came from poor districts, and it’s unclear how much voter ID laws affected those numbers. Relative to 2012, Republicans gained 225,000 voters earning $100,000 and over (+8.1 percent). Recall that they gained 335,000 additional working-class voters who earned less than $50,000 (+10.6%). It’s hardly a working-class revolt if wealthy voters are marching together with them, hand in hand. Democrats picked up more wealthy voters, too. Relative to 2012, Democrats lost 950,000 white voters in the Rust Belt 5 (-13 percent). This figure includes a loss of 770,000 votes cast by white men (-24.2 percent). Compare that number to the modest gains Republicans made in terms of white voters: They picked up only 450,000 whites (+4.9 percent). 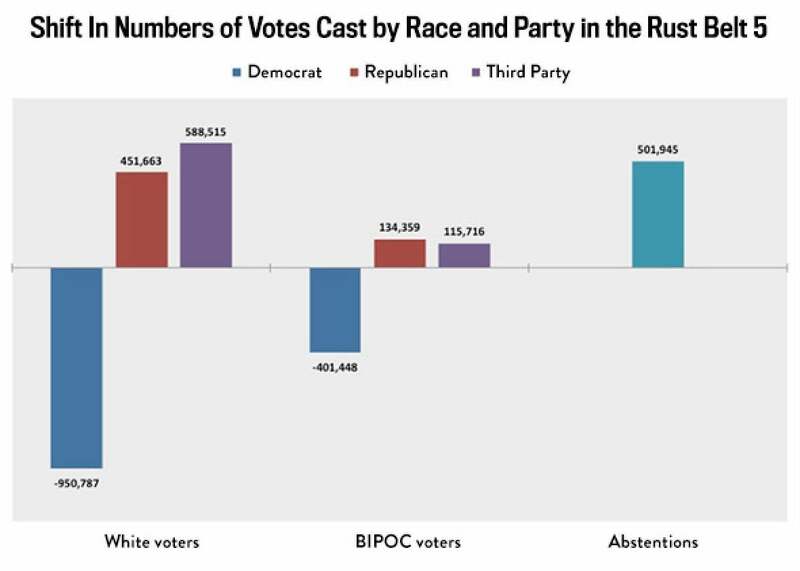 Democrats also lost the black, indigenous, and other people of color (BIPOC) vote in the Rust Belt 5, with 400,000 fewer voters in this category (-11.5 percent). While disaggregated exit-poll data on BIPOC voters was inconsistently available across the five states we examined, in those places where numbers were available, Democrats saw losses among both black American and Latino voters. Importantly, some of the greatest losses in BIPOC votes were in states such as Ohio and Wisconsin, both of which adopted voter suppression laws beginning in 2012. But even in states with no such laws, such as Pennsylvania, BIPOC turnout was significantly lower this election cycle. In short, more people of color stayed home in the Rust Belt in 2016 than in 2012. Compared with 2012, three times as many voters in the Rust Belt who made under $100,000 voted for third parties. Twice as many voted for alternative or write-in candidates. Similarly, compared with 2012, some 500,000 more voters chose to sit out this presidential election. If there was a Rust Belt revolt this year, it was the voters’ flight from both parties. In short, the story of a white working-class revolt in the Rust Belt just doesn’t hold up, according to the numbers. In the Rust Belt, Democrats lost 1.35 million voters. Trump picked up less than half, at 590,000. The rest stayed home or voted for someone other than the major party candidates. This data suggests that if the Democratic Party wants to win the Rust Belt, it should not go chasing after the white working-class men who voted for Trump. The party should spend its energy figuring out why Democrats lost millions of voters to some other candidate or to abstention. Exit polls do not collect information about why voters stay home. Perhaps it’s time someone asked them.